It is hard to believe harvest is upon us once again. This year marks my fifth Champagne harvest, five years living in the same place really is something of a personal victory! Especially when you consider that I stil am as excited as I was in 2012 when Onne and I picked at Jacquesson! Like 2012, 2016 has turned out to be a ‘difficult’ year: after a mild winter, the Aube was hit badly by late spring frosts, and on average lost 2/3’s of their crop. 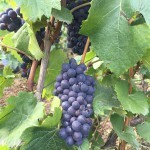 The wet growing season brought more losses, as mildew thrived among the champenois vines. The hail storm of the 14th of July made for more losses in some areas, and the heatwave at the end of august caused heat damage. 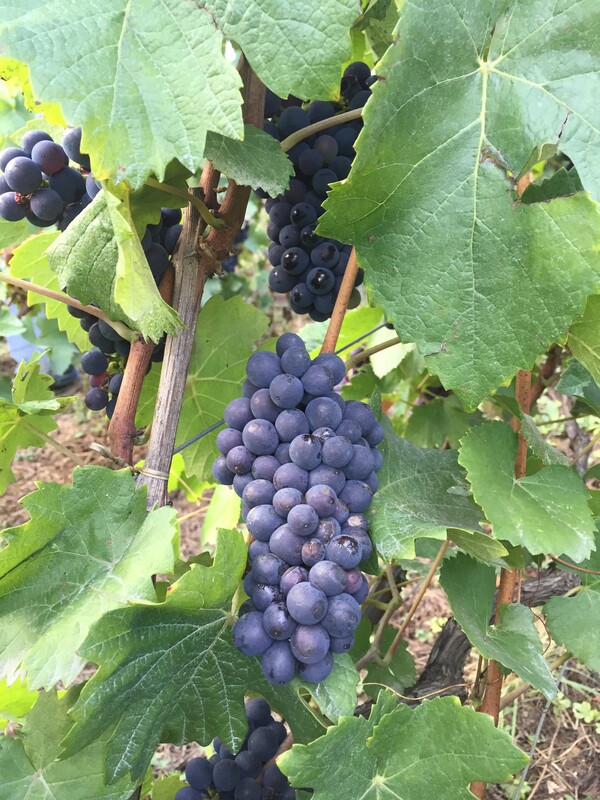 Needless to say there will be less grapes than other years, a lot less… Yields are estimated at 7,000 kg/ha, well under the appellation maximum, which was set at 9,500 kg/ha in July, and a long way away from last years average of 12,000 kg/ha. But even if the season has been hard, it looks that the result will be beautiful. The August sunshine worked its magic and the grapes and juices I tasted so far are very promising. 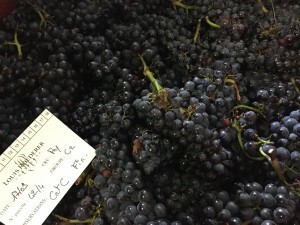 Well at least the dark grape varieties; the Meuniers and Pinot Noirs ripened in a record time of 80 days, but the Chardonnays need still more time. His namesake Jean-Baptiste Geoffroy said the same thing almost word for word later on Saturday afternoon when speaking about his Meuniers and Pinot’s. 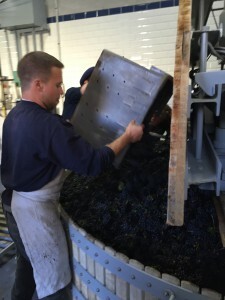 As I arrived the press was just being loaded with Meunier and I tasted the free-flow running off the press. The juice came in at 10.7% potential alcohol and again it had a great freshness. I should note here that acidity levels in Meunier are generally lower than the other two grape varieties, but according to Jean-Baptiste they are in line with the Pinots up till now. The Geoffroys began to pick in Cumières on Thursday as well, and the press loads has come in between 10.3% and 11.8% potential alcohol, with an average yield of 8,000 kg/ha. 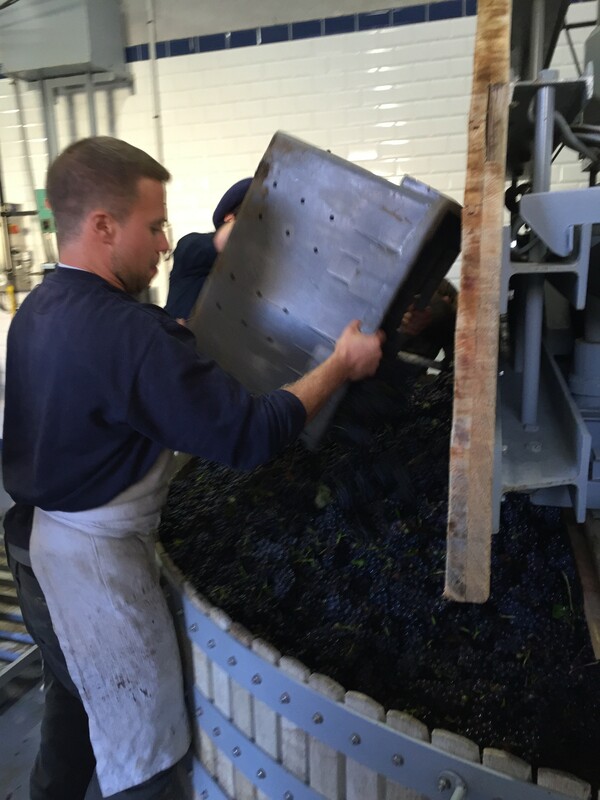 All grapes come from Cumières bar 2 plots which were picked in Hautvillers on Friday to make the Blanc de Rose. Jean-Baptiste fears that the vineyards in Fleury-la Rivières will be more complicated as they were particularly hard hit with mildew in June, but all in all he is quite happy.”I cannot complain, the quantity is a little less but we are harvesting some exceptionally beautiful grapes!”, exclaims Jean-Baptiste. I am very happy he decided to make a little amount of Coteau Champenois Rouge for we both agreed that this year would be excellent for still wines. But as Jean-Baptiste explains:”If I make a lot of red wine I will not be able to make enough champagne…” The Pinot for the red came in at 11.8% potential alcohol and I was blown away when I tasted the macerating grapes in the cask: amazing freshness, rosewater and hibiscus notes with tart red fruit. This is a Coteau Champenois I will stock up on in a few years time! Whilst I was there team Geoffroy destemmed some more Pinot to make the Rosé de Saignée, and once again I had no problem drinking several sips, pulp, skins and all!! So after two days tasting different Meuniers and reds from Cumières and Aÿ, I can but say 2016 is very quickly getting under my skin. 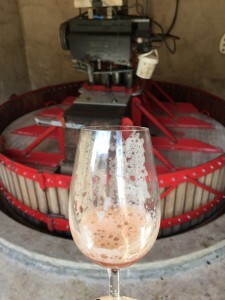 This entry was posted in Champagne, champagneharvest 2016, organic, terroir and tagged Ay, Blanc de Rose, champagne harvest, Coteau Champenois, Cumières, Jean-Baptiste Geoffroy, Jean-Baptiste Lecaillon, Johann Merle, Les hautes Chèvres, Les Longues Viols, Meunier, organic, Pinot Noir, Roederer, rosé de saignée, Vincent Laval. Bookmark the permalink.